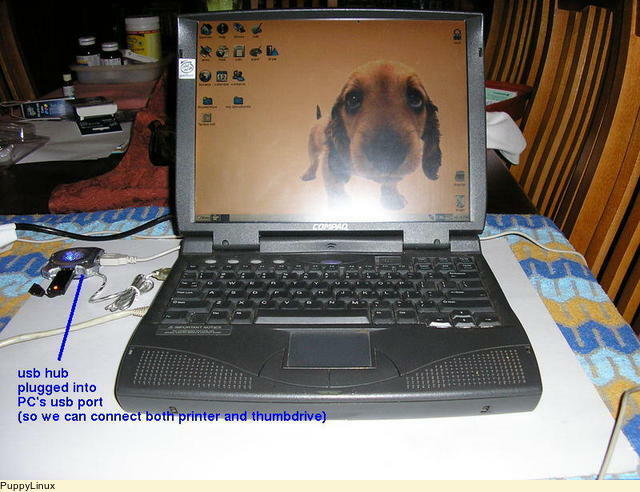 I used Puppy Linux to turn an old Compaq Armada laptop into a useable word-processor for a student. After many attempts with various lightweight Linuxes Puppy is the thing - version 2.17, not the latest which was just too slow (though whether that was inherent in version 4 or just because I used Xorg I'm not sure. For this install I used Xvesa and ext2 for the file system). This is the instructional doc I did for her. Not all PCs run Microsoft Windows. Apart from the fact that it has to be paid for, the modern versions of Windows (eg, XP and Vista) simply will not work on older, less powerful, PCs. Earlier versions of Windows are no longer supported, and my attempt to install Windows 98 on this Compaq Armada 1598DT was a failure. The alternative is Linux with X-Windows, a totally free software culture. There are many variants, some just as big and powerful (and needing powerful PCs) as Microsoft's product. However, because it is all free, Linux has spawned myriads of children, of all different sizes and niches. 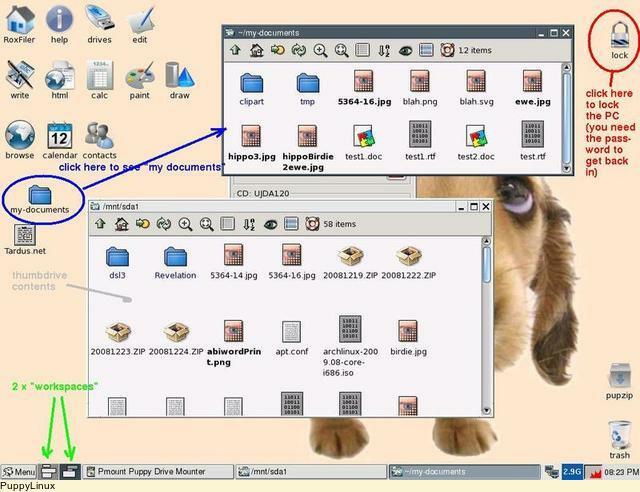 Puppy Linux is an Australian development, and is designed to work well on older PCs. It is a sweet little system on the Compaq Armada 1598DT (Pentium 266MHz, 96MB RAM). Not a moon rocket, but zippy enough to get the job done nicely. 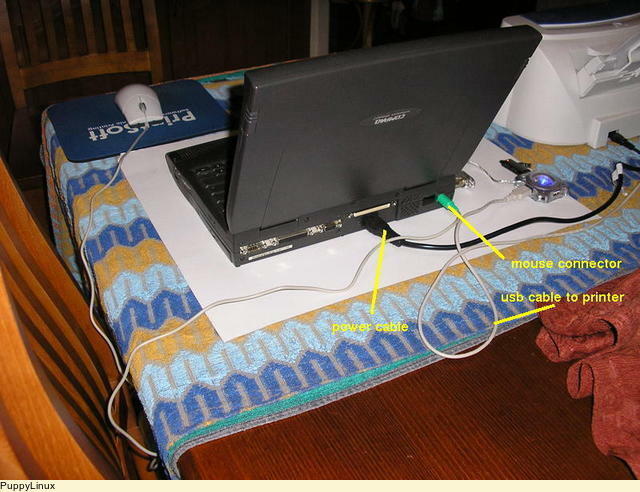 First a note - the laptop battery is a dud - too old now, so this is a "plug into the power point" laptop. Mouse - this is optional, and a nuisance if you are sitting with the laptop on your lap. Just use the built-in touch-pad and buttons. However, if you use it at a desk or table, the mouse is handy. Just plug it in to the mouse port on the rear of the laptop. 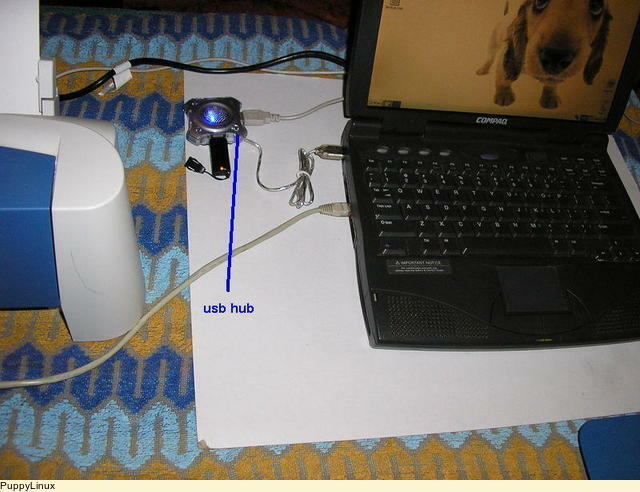 USB - there is only one USB port, and as you will want to use a thumb-drive and printer, there is a small "USB hub" - just plug it into to the laptop's port, and you then have 4 ports to play with. 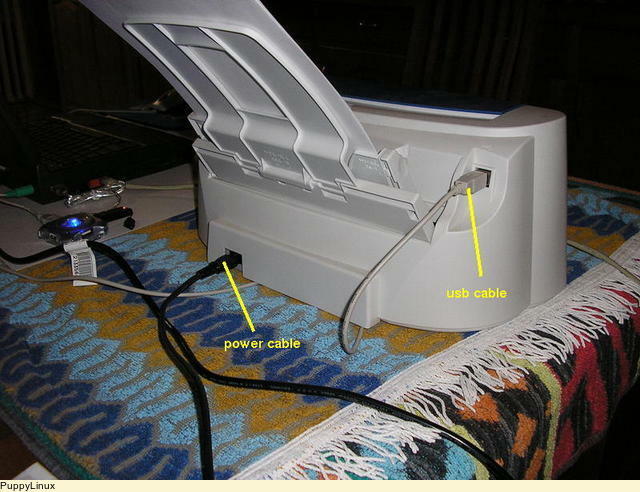 Printer - plug the USB cable into one of the USB hub's ports. Thumb-drive - ditto - you need to "mount" it to see its contents. More on that below. Just press the power button (middle, above the keyboard) and wait a few minutes. You do not need to login. The MENU button, lower left corner, is like the Windows "Start"
You have 2 "workspaces" next to the MENU button. This is just a convenience - you can select the 2nd one, open the word-processor, and then click between the workspaces - it can make navigating the different windows easier. You don't have to use it, but it can help. there is a "lock" button upper right hand corner of the screen. This will lock the laptop. Hit any key and it will prompt for a password - this is fidojnr, all lower-case. Don't forget it! Rule number 1 is "always keep 2 copies of anything that was worth the effort of creating in the first place". So, 1 on the thumb-drive and one on the laptop's hard disk. 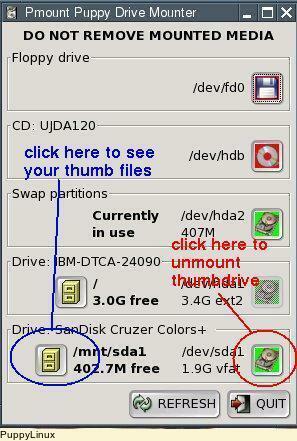 Before you can see files on the thumb-drive you need to "mount" it. 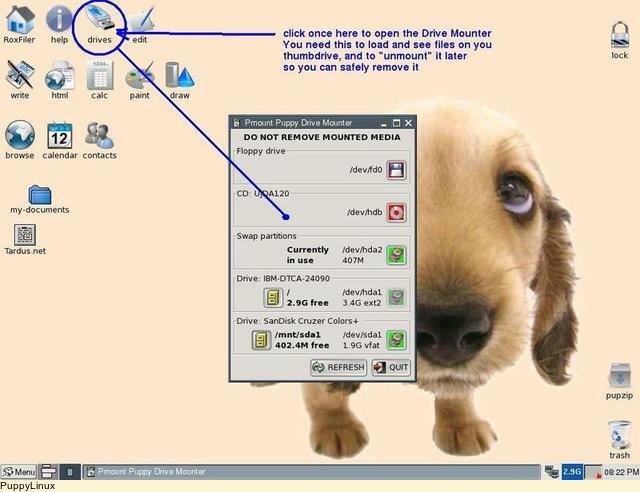 Windows does it automatically, but Puppy requires you to do it manually. After a pause the drives window will appear. 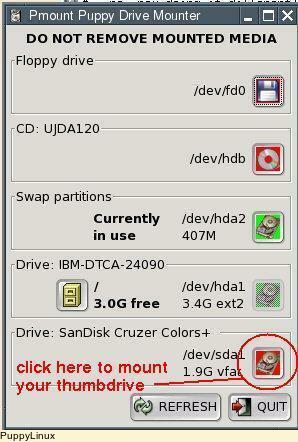 Note: - you MUST un-mount the thumbdrive before removing it from the computer, otherwise you may damage a file. To do this first close any file browser window that is open on the thumbdrive, then click the right-hand icon again (in the drives window). Note AbiWord by default saves its documents in its own format, ".abw". Use File > Save As to save in ".doc" format. Spell checking works (click the "ABC" button) but I could only get the USA dictionary working. You can train it by clicking "Add" whenever it objects to a word in Australian English, eg, "favour" - the Americans spell it "favor". 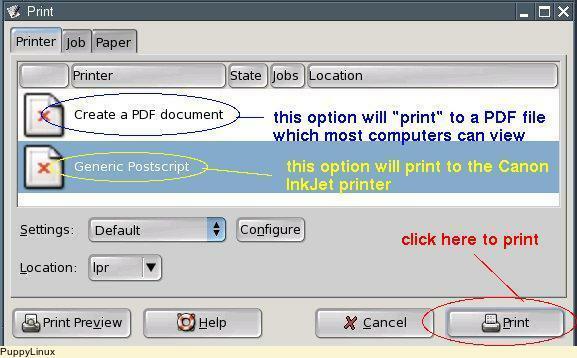 To print, select the "Generic Postscript" option and click "Print". After a pause the document will print. If you need a portable document file to print elsewhere, the PDF format is great. It is read-only, but can be read by just about any computer. 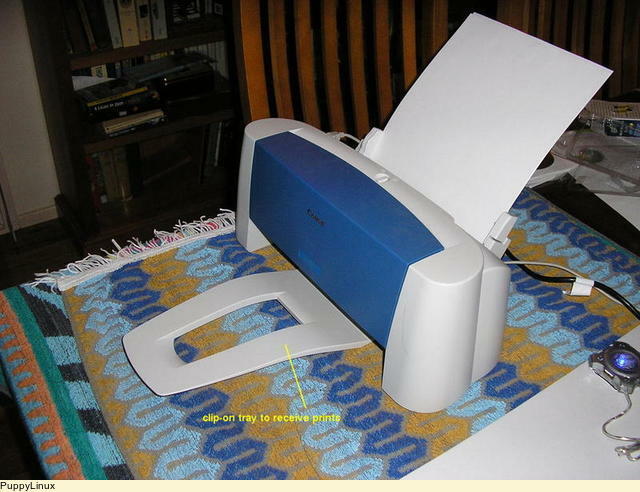 To make one, just print to "Create a PDF Document". A file called "output.pdf" will be created. To see it, click "RoxFiler" on the desktop, and you should see it. Right click it and you can rename it - select "Edit Item" and give it a name of your choice. Don't leave it as output.pdf as it will be over-written next time you create a PDF document. If you need it, Gnumeric is pretty Excel-compatible. Just be sure to save any Excel file as the older ".xls" format, not the 2007 ".xlsx" format. From Gnumeric, File Save As an ".xls" file. There are several ways of switching windows. drag the windows around (left click and hold on the title bar) until you see the window you want, then click inside it to make it the foreground window. From the MENU select Shutdown > Power-off Computer and wait for it to completely shut-down. It is best to turn off the power at the power point when you are not using it. It can get warm underneath, and its safer (eg, lightning strikes).